The Samsung Galaxy Note 8 hasn’t been announced yet, but there have been a wealth of leaks and rumors. 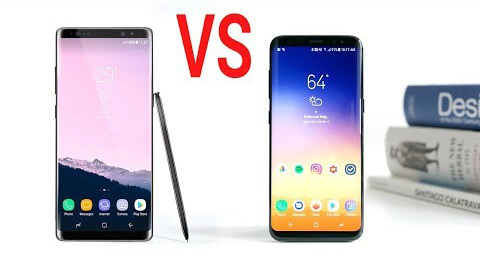 Assuming the most likely ones pan out how will the Galaxy Note 8 compare to the Samsung Galaxy S8 Plus? The Samsung Galaxy S8 Plus has a metal frame wedged between a glass front and back, and the images we’ve seen of the Galaxy Note 8 so far show an almost identical design, albeit with a dual-lens camera rather than a single-lens one on the back (more on that below) and a slot for the obligatory S Pen. Disappointingly, the images also show a fingerprint scanner on the back, suggesting Samsung hasn’t figured out how to put it under the screen – which is something the company has supposedly been working on for a while now. However, the Galaxy Note 8’s design might be refined slightly, with rumors pointing to even smaller bezels above and below the screen, while the dust and waterproofing of the S8 Plus is almost certainly going to make a return. One thing which might change for the worse on the Note 8 is the dimensions. It’s no surprise that this will probably be an even bigger phone than the 159.5 x 73.4 x 8.1mm S8 Plus, but one leak suggests the Note 8 will be 162.4 x 74.5 x 8.4mm, rising to 9.5mm thick where the camera apparently juts out of the back. There’s no such jut on the Galaxy S8 Plus, but it might be necessary in order to pack in a dual-lens system. The Samsung Galaxy S8 Plus is already massive, with a 6.2-inch Super AMOLED display making it bigger than the 5.7-inch Samsung Galaxy Note 7. It’s 1440 x 2960 for a pixel density of 529 pixels per inch and uses a super-widescreen 18.5:9 aspect ratio. That aspect ratio, combined with a near bezel-free, curved-edge design, is what Samsung’s calling an ‘Infinity Display’ and the same feature is rumored and expected for the Samsung Galaxy Note 8. However, it’s likely that the Note 8’s screen will be even bigger, though probably not by much, with rumors pointing to a 6.3-inch or 6.4-inch screen. Power is one thing you shouldn’t have to worry about with either of these phones. The Samsung Galaxy S8 Plus is currently one of the most powerful phones around, thanks to 4GB of RAM and either a Snapdragon 835 chipset (if you’re in the US) or an Exynos 8895 one (in most other places) – both of which are top-end. Rumors suggest that the Samsung Galaxy Note 8 will have the same chipset, with the same division in terms of which countries get which, but that it might up the RAM to 6GB. There’s likely to be even less difference when it comes to the operating system. Both will run Android and more specifically both are likely to run Android 7 Nougat. The S8 Plus already does, and with the Note 8 likely launching soon it probably won’t have Android O on day one. The camera could be one of the biggest changes, as while the Samsung Galaxy S8 Plus has a 12MP single-lens snapper, the Samsung Galaxy Note 8 is rumored to be getting a 12MP dual-lens one. Supposedly the second lens will be a telephoto one, offering either 2x or 3x optical zoom, and both lenses may have optical image stabilization. Battery size could also differ between these two devices, but not in the way you might expect, as while the Galaxy S8 Plus has a 3,500mAh one it’s rumored that the Samsung Galaxy Note 8 will have a slightly smaller 3,300mAh one – despite almost certainly being a bigger phone. The S8 Plus isn’t a cheap phone and the Note 8 won’t be either. The former launched for $825/£780/AU$1,350, and although you can now find it cheaper if you shop around it’s still one of the most expensive phones on the market. The Samsung Galaxy Note 8 is sure to cost at least as much, and rumors put it at between $1,000 (around £770/AU$1,300) and $1,200 (roughly £920/AU$1,560).